This year the 2014 Commonwealth Games were held in Glasgow and everyone in Scotland was keen for it to be a success. 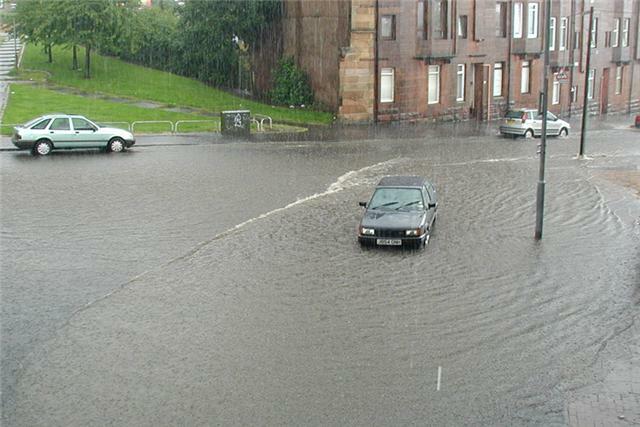 Glasgow however has a known history of summer surface water flooding (2002, 2007, 2011, 2012, 2013). The Scottish Flood Forecasting Service (SFFS) is responsible for flood forecasting in Scotland and we felt that if heavy rain was to occur, our existing surface water forecasting capabilities would not be sufficient to meet the expected briefing requirements. So what could be done? Surface water flood forecasting has until recently been regarded as challenging, difficult and often simply not possible. But with recent improvement to surface water flood mapping and ensemble forecasting for convective events we were keen to meet the challenge head on. The SFFS set up a project to develop an operational pilot for a 10km by 10km area of Glasgow and to explore future surface water flood forecasting methods for Scotland in general. The project was largely funded through Scotland’s Centre of Expertise for Waters (CREW), with the Met Office, CEH Wallingford, Deltares and the James Hutton Institute as partners. To ensure the pilot model would meet the needs of end users we set up a steering group of key responders in Glasgow. The steering group provided an excellent forum for scientists and operational responders to discuss the challenges of surface water flood forecasting from different perspectives, to engage end users with the project at an early stage, and to set realistic expectations for the model output. The steering group requirements were to focus on the 6 to 24 hour lead time as this is when proactive preparations can be made. Responders wanted guidance on event timings, locations that might be affected, possible impacts and severity and crucially a stand down message when the event is over or the risk level reduces. From a SFFS perspective the key goal was to have a fully operational model that combined forecasts and impacts and could be integrated with our existing tools. The pilot model aimed to make the best use of emerging science developments within our existing systems. The methodology built on some of the concepts that the Natural Hazards Partnership have been developing for a national surface water flood forecasting tool but applied them at a smaller scale and integrated them with existing SFFS tools. The model runs eight times a day using forecast rainfall from the Met Office blended ensemble (based on MOGREPS-UK and STEPS) and Nowast ensemble giving rainfall on a 2km grid for the next 24 hours. Each rainfall ensemble is run through the CEH Grid-to-Grid model to convert rainfall to surface runoff based on variable such as antecedent conditions, land use, slope etc. It is assumed that the surface runoff from Grid-to-Grid is equivalent to the effective rainfall used to produce SEPA’s new pluvial flood maps. This means that for each 1km grid square the most appropriate flood inundation map and impact assessment from the library can be identified. Threshold were set for people and property impacts (population, utilities, commercial properties and community services) and transport (road and rail) enabling impacts to be compared to our established severity thresholds. 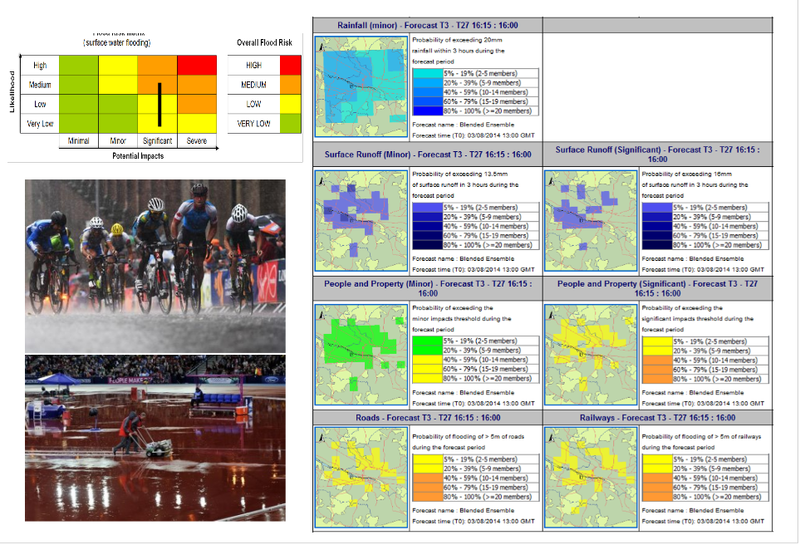 Combining this with the probability of exceeding the thresholds allowed the overall surface water flood risk to be identified within our existing flood risk matrix (Figure 2). The model output is viewed through web reports developed by Deltares utilising the Flood Estimation and Warning (FEWS) software (Figure 3). The reports showed output for a number of parameters over the full 24 hour time period and broken down into 6 hour time steps (an example is shown in Figure 4). The pilot model has been running throughout the summer. During the two week period of the Commonwealth Games an additional SFFS forecasting hydrologist was on duty alongside the national forecaster. They were responsible for producing the Glasgow Daily Surface Water Flood Forecast which was sent out to responders. An important part of their role was to brief the SEPA Resilience Officer who was advising organisations in the Games Multi Agency Control Centre to ensure SEPA was able to give a consistent and informed message about the flood risk to the Games. Luckily the weather during the Games was largely fine however there were occasions when the additional surface water guidance provided a real benefit to the organisers and responders. This took two forms, firstly enabling the SFFS to advise that although heavy rainfall was forecast in the wider West Central Scotland region, flooding impacts in Glasgow itself were unlikely. Secondly, as was the case on the last weekend of the Games, to provide information on the timing, likely impacts and probability of possible flooding in Glasgow. The pilot model has shown that it is possible to provide an informed surface water forecasting service and the feedback received on the service has been positive. The lesson we learnt during the Games is that the staffing requirements to operate such a service are high due to the need to continually monitor the forecast due to variability between model runs, and the briefing requirements to help end users understand the uncertainty. The data volumes involved in rolling out a similar service to the whole of Scotland would also require careful management. 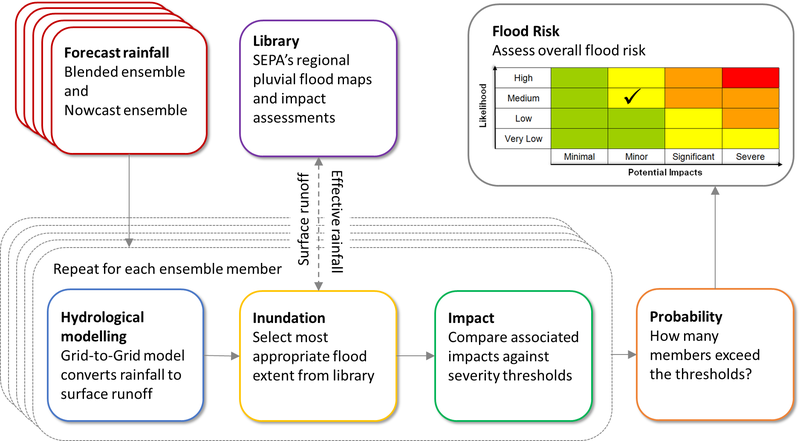 Improving capabilities for surface water flood forecasting is one of the core strategic aims of SEPA’s Flood Warning Strategy for 2012 – 2016 and we will use the experience gained in this trial to help improve surface water forecasting for other areas of Scotland in the future. Further details on the development of this project throughout the year are available on the SFFS blog. There is also a report for the initial review stage of the project. The work was presented at the British Hydrology Society conference (Sep 2014) and a research paper and final report will be published in due course so keep an eye out. This entry was posted in Uncategorized on October 7, 2014 by Rob Thompson.